As I said yesterday, I am so thrilled to be able to give one reader any pair of Blowfish shoes their heart desires. I suggest a big iced coffee to sip while you peruse their website. Might I also suggest the Illi in Natural Straw, like moi? You, too, could rock the straw wedges with the cute little almond toe shape and blush at all the compliments comin' your way. Though, really, any of their shoes are sure to garner compliments. And they are way comfy, ya'll. Giveaway open to US residents only. Ends Monday, May 27th at midnight ET. *Giveaway sponsored by Blowfish Shoes. Thank you, Blowfish! I am in love with the Gypsy wedge! I would definitely get a pair of those! I "liked" Blowfish on Facebook as Rubi Diaz. I followed Blowfish on Pinterest as Rubi Diaz. I "like" Good Girl Style on Facebook as Rubi Diaz. I am a GFC follower of Good Girl Style as Rubi Ruiz. I follow Good GIrl Style on Bloglovin' as Rubi Diaz. I love the Delmar in black! Majorly in love with the Illi in faux turquoise! Followed Natalie on Twitter as well! And liked Blowfish on FB! And liked Good Girl Style on FB too! I am oh-so-in-love with the faux straw style that you have!!! They do have lots of cute styles, but I'm definitely obsessing about those Illi faux straw ones!!! I am obsessed with Illi in the faux straw! Totally in love with the Nepal! I love the black Illi wedges so much! Loving Illi in Bark Faux Suede! The heel design is the cutest! I follow Blowfish Shoes on Twitter! Gypsy in Natural Cozumel Linen! I'm a Blowfish Fan on Facebook! I'm a GFC follower of Good Girl Style! Liked Good Girl style on Facebook! I like Blowfish Shoes on facebook! I'm a Blowfish Fan on Facebook! Gypsy is my fav. I follow Blowfish on twitter, pinterest, and facebook! I love the Dole shoes in Natural Cozumel Linen. I love the Reflect shoes! I'm a mom & I can totally see me running around with my kids in these during the summer. I have to choose?!? Ok, I like Illi! Love the Illi in natural straw! Oops, Anonymous there with Illi is me, Sarah. I liked Blowfish on facebook too. I liked good girl style on facebook too! I LOVE this shoe, Illi, posted in the picture. Seriously, my perfect shoe! I love them all!! Blowfish is my ultimate favorite shoe. They last so long and are so comfortable! I still have my first pair of boots and they are getting a bit rough, so I think it is time for a pair of TUGO'S in black relax PU!!!! I'm following @fashionatalie on Twitter! Loving the blue tacitas or the cricket...thanks for the chance to win! I Follow @blowfishshoes on Twitter. I loooooove the Tugo in black! I "Like" Blowfish shoes on Facebook. I Follow Blowfish shoes on Instagram. I Follow @fashionatalie on Twitter: @imZenaida. I love the wedges pictured here. The Illi wedges are super cute. To tell you the truth I love the Illi in the Natural Faux Straw or the Black Faux Suede with Zoo Print! My favorite style is Illi! Hands down! I follow Blowfish on Instagram. I love the Tacita in Black Nairobi Print! I'm IN LOVE with the Reflect esp. in the Turq Cozumel Linen color (: I follow on Facebook and Twitter!! I love the caroline in any color. I liked Good girl style on facebook. I love the caroline in any color! I follow blowfish on pinterest! I want the Pura in red! I follow blowfish on twitter!!! I am the biggest fan! Haha . 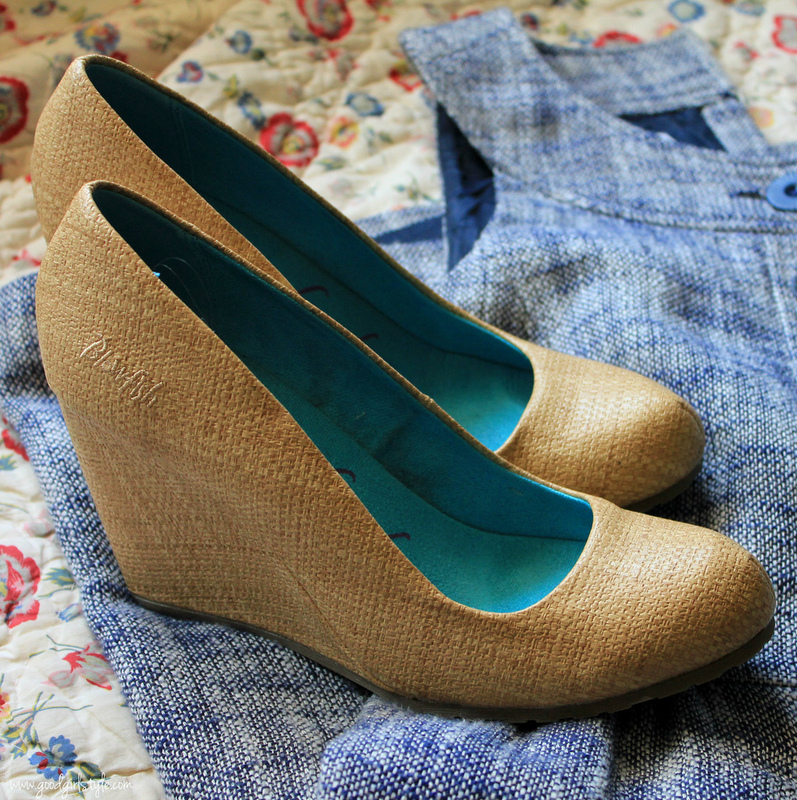 But really, I love the straw wedges! On my next shopping list! I love the Illi in Natural Straw! They are exactly what I am looking for!!!!! I loove the Coco in dark brown faux suede! I like Blowfish shoes on Facebook! And you probably need my email: ruby1027 at gmail dot com! I absolutely have fallen in love with the Nagoa shoe in Blowfish Shoes collection. I really want it in RED and in a size 10. I am now following Good Girl Style on Facebook! Look forward to your posts! I am a follower of Blowfish Shoes on Facebook. I actually own about 4 pairs of their shoes already. the collection is growing. I am now following Blowfish Shoes on Pinterest! Super cute shoes! Ahhh I want them all! I love the Cricket in the tan, "bark" color. I followed Blowfish on twitter. and just became a GFC follower of Good Girl Style! i love the delmar sandals in the bronze. also, i liked blowfish on facebook. I like the Gypsy sandals. I follow blowfishshoes on twitter ohsmiledarling! I follow blowfish shoes on pinterest ohsmiledarling!